Indonesian capture fisheries are among the most productive fisheries worldwide. They are also of high significance due to the support they provide to the livelihoods of millions of small-scale fishers. More attention is now being given to data-poor and small-scale fisheries which impact livelihoods, the economies of developing countries and the management of stocks. 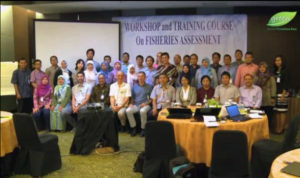 A Crawford Fund Master Class on methods for assessing data-poor fisheries was held for 38 participants from 24-28 August in Bogor, Indonesia. The participants were university staff and postgraduate students, officers in the Indonesian Ministry of Marine Affairs and Fisheries, and representatives of non-government organisations (WWF, Masyarakat dan Perikanan Indonesia, Conservation International and Wildlife Conservation Society). interpreting and presenting the findings from these analyses. These methods were applied by working groups to eight Indonesian fisheries: blue-swimmer crab, cichlid, coral trout, lemuru, lobster, silky sharks, and yellow-fin and skipjack tuna. Professor Neil Loneragan, Leader of Environmental and Conservation Sciences at the School of Veterinary and Life Sciences at Murdoch University, managed the Master Class. “Few fisheries have the financial capacity to pay for expensive scientific surveys and stock assessments, let alone facilitate meetings and workshops, which foster understanding and communication between stakeholders,” said Prof Loneragan. Craig Proctor, of CSIRO Oceans and Atmosphere in Hobart, was a co-organiser of this Master Class and was previously supported by the Crawford Fund to run a fish ageing training workshop for scientists from Indonesia’s marine and freshwater research institutes. The Applied Fisheries Master Class identified some areas of research that will improve assessments for the eight fisheries considered, and started to collate information on the biology, fishery and management of the eight species groups. This information may provide the basis for a reporting system that is reviewed on a regular basis. A short video on the master class (in Bahasa Indonesia) is available to view here. 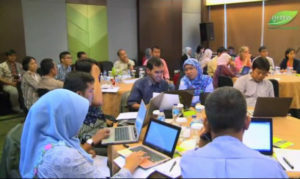 The master class was developed through discussions between Murdoch University, CSIRO, Bogor University and the Ministry of Marine Affairs and Fisheries of Indonesia.